Do you want to give all the guests at your upcoming wedding somewhere to sit and relax when they’re not hitting up the dance floor or gathered around the buffet? There are more and more brides and grooms providing their wedding guests with lounge areas at their receptions. A lounge area is a place where people can go at any point during a wedding to mix and mingle with others while sitting down for a few minutes. If you and your significant other are thinking about incorporating a lounge area into your wedding reception, there are certain things that it should include. From tables and small decorative touches to couches and even bean bag chairs, your goal should be to make the space as comfortable as possible for your guests. Here is how to craft a wedding lounge area with bean bag chairs and so much more. The first thing you want to do when designing a lounge area for your wedding is finding the right location for it inside of your reception hall. Ideally, locate the lounge should in a place where people are going to see it once they walk into your hall. But at the same time, you don’t want the lounge to overcrowd your space and steal the show. Pick a place that will be out of the way so that people can spread out when they come to take a seat. You want people to feel like they’re stepping away from the action to regroup when they sit down in your lounge. It’ll make it a much more relaxing space for everyone. Once you have the location for your lounge area all picked out, the next step will be to decide exactly how big you want your lounge to be. The size of your room should coordinate with the number of guests that you’re going to have at your wedding. The last thing you want to do is set up a lounge with just four or five seats in it when you’re going to have 250 people at your wedding. At the same time, you also don’t want to create a lounge that can seat 20 when you’re only going to have 75 people at your wedding. Your lounge should be just large enough to accommodate a small percentage of the people who will be at your wedding without feeling too crowded. It should also be able to fit nicely within the square footage that you’re allotting to it. After you decide how big you want your lounge to be, it’ll be time for you to start assembling it. And the first thing that you’re going to want to put into your lounge area is plenty of seating since it’s going to serve as a place for people to sit down. Most couples begin by picking out a large couch that they can put at the centre of their lounge. The sofa will set the tone for the entire salon and help define the space, so you should spend some time considering some different options. Do you want a more traditional couch that makes space feel very formal? Or do you want something more fun that will let your guests know they can put their feet up and relax in your lounge if they want? Regardless of which direction you decide to go, the large couch should be positioned smack dab in the middle of your lounge. It’ll give people a place to sit while also separating your room from the rest of the reception area. When you fill your room with beanbag chairs, it will immediately start to take shape! Once you’ve put your large couch into the proper position, you’re going to want to surround it with lots of other seating options for your guests. You could use regular old chairs to allow your guests to sit down. But why do that when you could go with bean bag chairs or bean bag lounges instead? From a Lambswool Bean Bag to a Samui Lounger, you can pick which bean bags you like best for your room. If you choose to place bean bag chairs into your lounge, they’ll be a massive hit with your guests. You’ll get so many compliments from people on your creativity. When people start to gather in the lounge area at your wedding, they’re going to want to do more than sit down. They’re also going to want to find a place to put their drinks, purses, clutches, and more. Some people might even use your lounge to sign their wedding cards for you. With these things in mind, it’s a good idea to incorporate a few tables into the mix in your lounge. From large coffee tables to small end tables, you can find tables in all different shapes and sizes that will work well for your space. You don’t have to go too overboard and put tables everywhere. But you should have at least a couple of them in the lounge for your guests to put things down. You’re probably going to have your wedding flowers scattered all over the place at your wedding reception. They’ll be by the front door, on the dining tables, and even up near the DJ booth. Don’t forget to place some of them in your lounge as well. You don’t want to cover your tables with them and cut into the tablespace you’re providing for your guests. But a few strategically placed wedding flowers can brighten up your space and make it feel a lot warmer. You don’t necessarily want your guests to spend an hour sitting in your lounge hanging out. You want them to come out of the room and take part in all your wedding festivities. But while they’re in the lounge, you should give your guests some different eye candy. Some of these things might include photo albums of you and your significant others as well as photos of your wedding party and more. Photos will help your lounge area to feel more personal. They’ll also give your guests something to talk about among themselves while they’re sprawled out on bean bag chairs taking a breather. At this point, your lounge area should almost be ready to go! If you were to leave it as-is, it would already be a massive hit with your guests. But you can put your lounge over the top by adding a few small decorative touches to it. They’ll tie the whole room together and make it even more inviting than it already is. You might want to put an area rug down in the lounge to differentiate the space from the rest of the reception hall. You might also want to throw some custom pillows on the couch and bean bag chairs. Do whatever you can to make the lounge as unique as possible. Your efforts won’t go unnoticed when your guests arrive. When people start to show up for your wedding reception, there’s a chance that some of them might be under the impression that your lounge area is off-limits. Your guests might think the wedding party has exclusive access. Have your wedding DJ make regular announcements throughout the night to encourage people to come and enjoy the lounge. You will have worked very hard on it, so don’t let people leave your wedding before they’ve had the opportunity to sit down on a comfortable bean bag chair and relax. Outfitting a wedding lounge area with bean bag chairs is an excellent idea. 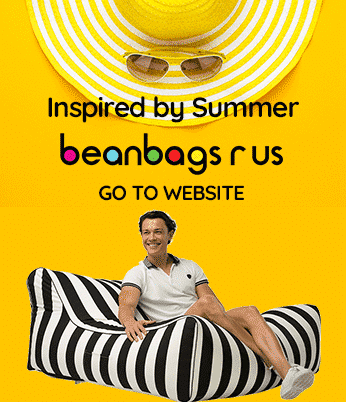 But you do want to make sure that you choose the right bean bag chairs for your guests. Your bean bag chairs should be the right size. They should also be high-quality bean bag chairs that will work well with the rest of your wedding decor. We can provide you with the right bean bag chairs for almost any occasion. Contact us to learn more about the bean bag chairs that we have in stock.